People ask me questions all the time about feeding toddlers. Which foods to introduce, when, how I feed my toddler, how I avoided picky eating (ha, we didn’t!). First off, this post is not about introducing solids to young infants; that’s a whole ‘nother can of worms. This post is specifically about feeding toddlers who have presumably already been introduced to a wide variety of foods, flavors, and textures by the time they’re, say, 18 months old or beyond (exact timing may vary, as all children go through developmental milestones at different ages, but I want to at least give you a ballpark age here). A little disclaimer: I’ve intentionally steered clear of writing a post like this for a LONG TIME. Why? Because giving nutrition advice for kids borders on giving parenting advice, which is something I never, ever, ever, ever want to even attempt to do. Every kid is different, every parent has their own set of things that are important or not, and (at least for me), many parenting books/advice make broad sweeping recommendations that don’t work in every situation, which then leaves you feeling defeated as a parent because you “followed the rules” and still failed. So, please understand that my post is NOT about giving you more rules to follow, it’s about the ways we approach food to *hopefully* help set our child up to enjoy food and eat mindfully now and for many years to come. 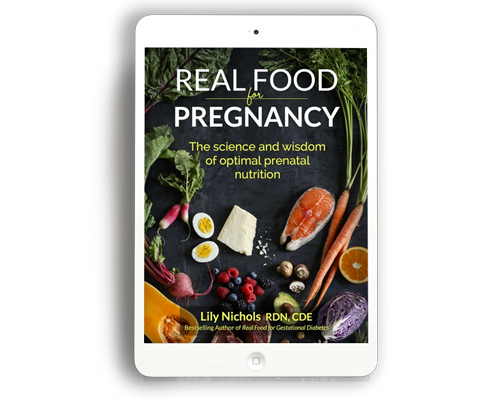 If you’re familiar with my real food approach for pregnancy (as outlined in my books, Real Food for Pregnancy and Real Food for Gestational Diabetes), then you know I’m a proponent of basing your diet around nutrient-dense, unprocessed foods as much as possible. The rationale is to meet your nutrient needs (especially micronutrients) through food first before having to resort to an array of supplements to fill in the gaps. 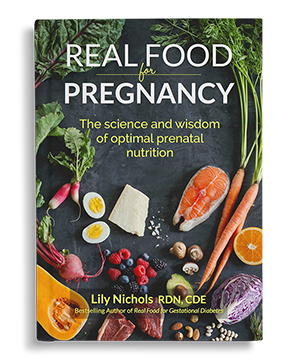 Emphasizing a mostly real food diet also helps ensure your baby gets all the nutrients needed to thrive—and that you, the mama, can avoid/mitigate common pregnancy discomforts or complications. It’s a win-win. Technically, much of the general nutrition for pregnancy advice also carries over into pediatric nutrition (that is, many of the same nutrient-dense foods that helped optimize their brain development in utero continue to be important once they’re out of the womb—nutrients like iron, vitamin B12, choline, DHA, iodine, etc.). The challenge now is that this little person has opinions and preferences of their own and may not want to eat all the foods that you so lovingly prepare for them. Annoying, right?! Now, when it comes to real food for toddlers, I could give a super nutrition-only focused answer. I could also pretend that the food choices and meals in my home are all squeaky clean, perfectly balanced, blahblahblah… but I’d be lying. I may read a lot of research studies and be super passionate about real food nutrition, but I’M ALSO A MOM—a mom to a very independent, outspoken toddler. He’s a toddler, like so many others, who is in the developmentally normal stage of expressing what he likes and doesn’t like, taking control of his environment, and making choices for himself. With that said, the only thing controlling about the way I approach food is the what—meaning WHAT foods I bring into the house. I’m not controlling about the when, why, or how. I’m not even controlling about macronutrient balance at individual meals/snacks with him (though I do always try to offer protein/fats since they have the macro and micronutrients so crucial to brain development). It is futile to try to control the way another person eats and frankly, I think it can be dangerous (many years downstream, anyways… more on this in a bit). My role is to offer nutrient dense food, let him pick from those options what he’s in the mood for and how much. And that’s it. Side note on snacks: I also welcome him asking for food and never deny his hunger; I don’t agree with forcing small children into meal schedules when their tummies are so small and their metabolism so fast. Many, many, many people strongly disagree with this approach, so all I can say is to find what works for your kiddos and your family. I have a hunch that if snack foods are not real food (meaning highly palatable, carb-y options made from a base of white flour—cereal, crackers, puffs, etc.—then “snack time” can interfere with their acceptance of the real food you’re offering at meals. Because I intentionally don’t offer those foods, snack time at our house is just more of the same types of things he’d have at meals. So, for me, I don’t care if his snack at 3pm means he’ll eat less at 5pm; it’s all good food! Eat when you’re hungry, kid! Kids are incredibly perceptive. They pick up on so much, whether we like it or not. Your relationship with food will be, for better or for worse, something that they pick up on. The words you use to describe food, to offer foods, to entice them to try something new, to influence whether they eat something or not… they matter. The following is how we approach talking about food in our house. I don’t pretend to have this all figured out, but I do know that keeping conversation light and positive around food plays at least some role in shaping his healthy relationship with food for years to come. First off, we don’t talk about some foods being good or bad for him (i.e. I don’t say things like “you can’t have the cupcake because it’s too high in sugar and sugar will make you fat”). Then I’ll proceed to offer alternatives, like blueberries or whatever his favorite fruit or snack is at the moment. You know your child, so you probably have your own negotiations/distractions that work in these situations. Some days I have to offer a lot of empathy and reassurance (“I know, honey. You really like cupcakes. They are such a yummy treat. I wish we could have them everyday, too. We’ll need to wait until the birthday party for a cupcake.”) and some days he happily redirects to the next distraction in the grocery store. There is no discussion of a food being too high in something (like sugar or calories), no discussion of how it could make him fat… (notice these are all external justifications), we simply focus on how the food will taste and make him feel. In other words, we’re continually reinforcing mindful eating practices. Emphasizing how foods make you feel versus focusing on their nutritional worth/health effects is something my own mom did and it seemed to work well. Despite raising two girls in Los Angeles of all places, neither of us developed eating disorders or body image issues. I was quite literally surrounded by diet culture and media, had friends and college roommates with severe eating disorders, I studied dietetics where many of my classmates had eating disorders, and yet somehow I escaped. The closest I ever got to developing unhealthy and obsessive habits were 3-fold at 3 different times in my life: 1) going vegetarian, 2) tracking food & calories for a dietetics class, and 3) attempting to do cardio at the gym regularly. Isn’t that ironic? These are some of the very tactics people try to get healthier! Thankfully, it was ingrained into my subconscious from my childhood that if something didn’t make me feel well, it probably wasn’t good for me. I gave up all of those habits before I developed disordered eating or a full blown eating disorder because I knew how to listen to my body. Let me reiterate: If something doesn’t make you feel good, stop doing it. Isn’t the whole point of raising children to help them develop an inner compass to make good choices regardless of if it’s food or any other thing in life? I don’t expect that to align with everyone’s parenting philosophy, but it aligns with mine. If I make all the choices for my own son (especially around food), if I try to tell him that I know better and you have to do xyz, how is that serving him in the long run? Sure, I can force feed him and deny him any treats, and he’d probably have a better nutrient intake (in the short term), but it just doesn’t sit well with me. What happens when he’s school aged and surrounded by junk food all day? What happens when he’s at a friend’s house where they don’t prioritize real food? What happens when he’s in college and fends for himself with meals? What’s one thing that’s always going to be with him to guide his choices? The signals it send him around hunger and fullness, and what foods keep him energized, and what foods leave him feeling lethargic and anxious and bloated. Now I realize, this is me projecting WAY into his future, but I do believe that learning your own boundaries around food is important. The older kids get, the less we can insulate them from the fake food of the real world. Even though in infancy, during the most formative time of developing taste preferences, his diet was essentially all real food, I now intentionally allow some treats. I’ve known too many people who grew up in super strict health food-only houses who rebel beyond comprehension when they first contact highly palatable processed food. If you’ve always been told that you have to eat a certain way instead of feeling how much different you feel when you eat one way versus another, why wouldn’t you rebel? But for those who have been given a chance to explore different foods, you might have the foresight to think: Do I want to feel like crap from over-indulging? Or do I just want to have a taste of that food and move on the next meal and eat normally again? I know, for me, having had the freedom to eat treats/junk food on occasion meant that there wasn’t an emotional or rebellious pull to act out through food. Why? Who does it serve in the long run? What am I rebelling against when I already set the “rules” around food for myself? So, after that lengthy tangent… Sometimes meal times mean my son eats all the foods we offer, other times he only wants banana (seriously, what’s with toddlers and bananas? ), sometimes he’s not hungry when we’re eating… it doesn’t bother me. Next time he’s hungry and I offer him something to eat (and I usually rattle off the nutrient dense stuff first ), he might choose an egg, or oysters (not joking), or sardines (also not joking), or green beans in butter (for the third time, not joking). That is knowing your body. That is savoring your food. That is life. Encouraging real food for toddlers can be a challenge, but allowing for treats on occasion helps them develop mindful eating skills that will benefit them for the rest of their lives. If my (probably-not-what-you-were-expecting) approach to feeding toddlers speaks to you, please tell me about it in the comments. As I stated in the beginning of this article, I don’t pretend to have this all figured out. I don’t claim to be an expert in pediatric nutrition (hello, prenatal nutrition is really where my passion lies). All I try to do is encourage as much real food as possible for our whole family (that includes our son) while allowing for flexibility and space to explore fun foods on occasion. Please share in the comments some of the ways you’ve found helpful at handling the challenges of feeding toddlers, managing snack time versus meal time, deciding when to allow treats or when not to, and anything else that you think might be helpful for other parents. We can all learn from each other—and pick and choose little “parenting hacks” to incorporate into our lives. PS – If you found this post on real food for toddlers helpful and if you’d like to see a post on introducing solid foods to infants, let me know. I can share how we approached this in our family. I’m happy to detail the (probably imperfect) steps we took to end up with a toddler who will—at least sometimes, between picky eating phases—ask for things like oysters and green beans. Glad it resonated with you, Tai. I’ll make a note to write one on introducing solids. Great post Lily, this is definitely a struggle in our home too. It’s a fine balance between balancing our need for control and trusting in their own instincts. Although my 13 month old eats anything and everything, we struggle with this often with our 2.5 yr old. I worry daily that he eats too much protein and not enough (or any) vegetables – he would eat can after can of mussels, oysters and sardines, or any meat on a bone, but won’t touch anything green, although it’s on our plates at every meal. It’s a really tough stage! For what it’s worth, my son has phases where he won’t touch vegetables either. Sounds like his body needs the nutrients in those foods he’s craving; those are all incredibly nutrient-dense. Have you seen feedinglittles.com? Their BLW and toddler feeding courses are spot on with what you discuss. Totally changed my perception of feeding my littles. Thanks for all the great info! Real Food for Pregnancy was a game changer for me the second time around! I want to hear more about introducing solid foods to infants! I don’t trust my obgyn’s advice since it’s the same regurgitated advice they’ve been giving since the 70’s with hardly any updates. Excellent article! I so appreciate the “real talk” here and hearing how a nutrition expert approaches toddler food (and that it’s not about perfection). I’m also fortunate to have a toddler who likes lots of foods, including some unusual ones for kids (and yes, I do a silent mama fist pump when she asks for salmon, or olives, or bell peppers). One challenge I’ve had so far are the snacks they offer at her school. They’re required to follow USDA guidelines which = lots of grains. It means she’s having cheddar bunnies, rice cakes, processed wheat products like waffles and crackers pretty much daily. They also include vegetables, fruits, hummus and seed butter, but it was a struggle for me to decide if I should forego school snack and pack her own, or just roll with it (and I even tried meeting with the directors to see if they could change the menu – sounds like they may be open to it down the line, although it still needs to follow USDA for licensing reasons.). She’s fortunately not allergic to anything, so for now, I’ve decided to just go with it. I don’t want anything to feel forbidden or off limits for her – or as you mention, create that sense of rebellion down the line – and we eat nutrient dense, real food at home. Having a healthy relationship with food is my top priority for her, but it’s definitely been a challenge to decide how to handle this one. Yeah, I can understand that challenge. I agree, I feel like you can make up the difference with more nutrient-dense foods at home. Kids seem to be pretty intuitive about when they need more of certain nutrients. For example, I know my son is going through a developmental milestone or growth spurt when he gobbles down eggs, sardines, beef, and oysters. Must need all that extra B12, iron, choline, DHA, iodine, protein, etc. Other times it seems like he’s eating an excessive amount of fruit. I try not to worry too much. It tends to balance out over the course of the week. I completely agree with this tactic and it’s what we’ve been doing with our toddler as well. I never even realized it was out of the norm to “just feed him when he asks” until my mom was over one day. My toddler asked for cheese ( what ended up being 5 pieces of cheese) while I was making dinner and my mom told him he had to wait until dinner. It seemed ridiculous to me that he should be arbitrarily told to wait 30 minutes when he’s hungry right then. If I were hungry while I was cooking dinner I’d certainly be able to grab myself a small snack why should the rules be different for him? We feel the same way about meals. Maybe he’s not in the mood for what’s on his plate and chooses not too eat, that’s fine too. It doesn’t mean he gets customized meals at his whim but if he decides not to have dinner that’s his choice. Also I’d love to hear your thoughts on son introducing solids to infants, we’re a few months away from that with our 4 month old now. The pediatrician has already not old us to start solids but we won’t plan to do that until 6 months at the earliest. I feel the same. I want him to learn that he can trust his hunger cues and to not deny him food when he’s truly hungry (of course, you know when they’re not *really* hungry when they only want a treat, haha). Please share more ab introducing foods to infants! Wonderful blog post! Thank you for sharing. That makes complete sense, April. Thanks for sharing what’s working for your family. I struggle with navigating the world of food choices with my 10 year old daughter who does have food intolerances and is very sensitive to blood sugar spikes (moody, violent, angry). I try not to be overbearing and restrictive, but at the same time, when she does eat cupcakes and candy she turns into a mean monster and it’s a major source of stress for our family. I like your emphasis on connecting what you eat to how you feel, but unfortunately when I ask her how she feels when she eats those foods she says she feels amazing, it tastes so good, she feels energetic…all positive things. How do you argue with that? Hmm that is tough. Sounds like when her sugar crashes and she turns moody/violent/angry? The sugar high can feel good/exciting, but the crash is hard. Maybe once she’s cooled down, you can calmly talk it over? It may be the case where you DO have to restrict specific treats and high sugar foods that are triggering negative behavior. I’d do what feels best for her and the family as a whole. Love this! Sometimes I think I get a little too in depth with my 4 year old; I’ll try to focus more on how she feels instead of the specific nutrients of eat food. But gotta say, my toddler LOVES sardines and I think of you every time she eats them. We totally do the same thing and I’m curious how it may change as my little one gets older (currently 13 months). People are so shocked that he loves eating sardines, fish eggs, liver and sauerkraut on the regular, but to him, he’s never known anything different! We’ve found it helpful thus far to simply put food in front of him and he chooses what he wants (and what he will throw on the floor 😉 ). We can learn a lot from our children about what the eating experience should be like and how we can learn to listen to our own body’s needs. Thanks so much for this post Lily! I’ve always wondered how you approached meals/snacks with your little one. I am starting solids with my 6 month old so would love a post about introducing solids, as well as your opinions on the new research around introducing allergenic foods as early as possible instead of delaying them. Thanks for all you do!! As a side note I totally credit your Real Food for Pregnancy book with the great pregnancy and birth I had with my second baby! I know you didn’t intend for this to be a “how to” article, but I’m super relieved to hear I’m not making huge mistakes! 😉 We let our toddler snack on healthy foods throughout the day because she seems to have a really hard time downing enough in one meal. She chooses from our healthy options and gets super excited about berries. We’ve also learned she doesn’t like to eat the same thing many times in a row (who does?! ), so we try to keep Foods in rotation. With this method, she is always happy to eat something we have to offer. Appreciate your thoughts and experience! This article was so helpful! My family and I have had a very unhealthy typical western diet until recently when I became pregnant. I knew that diet was important during pregnancy and we were eating so terribly. Something had to change. That’s when I started researching and found your book! It honestly changed my life. I’ve come a long way when it comes to healthy eating but it is still a struggle to get my fiancé and 5 year old step son on board. Very interested in how you introduced solid foods as my new son is currently 5 months old! I love this approach and it’s very similar to how we do things in our home. My 3 yo loves mussels, sardines, eggs, veggies and has even gotten into arugula lately! My challenge is him not eating much for dinner and then asking for snacks 10 min later (or during bedtime). I think he’s actually hungry since he didn’t eat at dinner, but he’ll refuse more dinner if I offer that. At bedtime I think it’s often a delay tactic!! Also, how do you handle food good/bad messaging from outside the home? We never put labels on food but he is constantly asking “is this food good for our bodies?” – I think daycare must be using that line of thinking to try and teach about nutrition . Thank you! I was seriously just going to ask you if you would write a post on toddlers. And our daughter is six months old so I would love an introduction to solid food post too! Could you share share some recipes your son likes? Love this Lily!! Thank you. So helpful. Such a good point—learning to listen and follow our internal compass is the most important! Stay tuned for a follow up post on feeding infants! Thank you for this post! So needed and encouraging at this stage with our daughter. Would love to hear your thoughts/take on introducing solid foods to infants. Thank you Lily Nichols for your wonderful, thought provoking, research based advice and wisdom. Such a wonderful article, thank you! Would love to hear more! Really enjoyed this! Before my boys were born I had visions of their plates being full of liver, kimchi, and egg yolks. While they definitely enjoy those things, there have also been the occasional nights where dinner has turned out to be quesadillas or bananas with unspeakable amounts of peanut butter. It took me a little while to realize the occasional sugar bomb at birthday parties wouldn’t do any extreme damage, so for now I’m enjoying their adventurous palates and increasing self-awareness to how different foods make them feel. Love your attitude and all of the great information on nutrition! Please do a post (or several!) on baby led weaning, any changes in nutrient needs of kids as they grow, etc. I think all of us have visions of our kids eating perfectly all of the time, but alas, that’s not real life! Stay tuned for a post on real food for babies. I would love to know more about how you introduced food to your little guy when he first started solids! Currently 29 weeks pregnant and feeling confident in my nutrient intake with the help of your wonderful book! I actually “failed” my glucose test (7.8 on the dot instead of under 7.8) and decided to monitor at home (with your help) and have all the confidence in the world that my blood sugar is completely under control now. Thank you for everything 🙂 Since I enjoy “nerding out” I actually just had a complete micronutrient blood test done – can’t wait for the results! Loved this! and sharing with fellow moms and clients. Just letting my 5mo explore tastes and textures, not eating any solids yet. But he loves to gum a big slice of bell pepper. A little concerned about what I will do when he does start eating more and goes to day care 2x week where breakfast is cereal + fruit, and snacks are ritz crackers or snack mix. I may just let it go….but that doesn’t feel 100% right knowing what kinds of ingredients are in them and that it is 2x week, not 1x month etc. Loved this post, even if it is a ways off for us still (our baby bear is 5.5 months old)! So many great nuggets of info, but I think my big takeaways involve really being aware of the language we use when talking about foods, and avoid assigning “morality” to foods (good vs. bad foods, which then makes you a good vs. bad person for choosing to eat a certain food). So much of these sayings and wordings are just on autopilot for us, so I am grateful to have at least a little bit of time still to practice and revise my own entrained patterns! A mindful, positive relationship with food and respect for our body is important for our boys just as much as girls. And it sounds like you’ve gotten a lot of requests already, but YES PLEASE, would love to read a post on introducing solids to baby! This is right around the corner for us, so couldn’t come at a better time. Even as a real-food dietitian with those same idyllic visions of my baby eating egg yolks, liver, and butter, I’m still a little nervous about having to defend my choice to avoid rice cereal and just go for the real stuff! I love this info on real food for toddlers, I wanted to know if you have an actual book or just info…looking for meal plan options. My son is almost 3 and although I believe he has pretty good eating habits and likes a variety of foods I still struggle to provide health snacks and a wider variety at dinner…he is not a fan of meat right now and he is too smart to trick and hide it anymore! He is addicted to pb crackers probably his most “unhealthy” snack – not too bad, considering I have seen worse! Otherwise, he like a wide variety of fruits and vegetables and healthy fats. Thank you for the amazing insight, tips, and common sense we need be reminded of! They go through so many phases. Sometimes it’s hard not to worry! 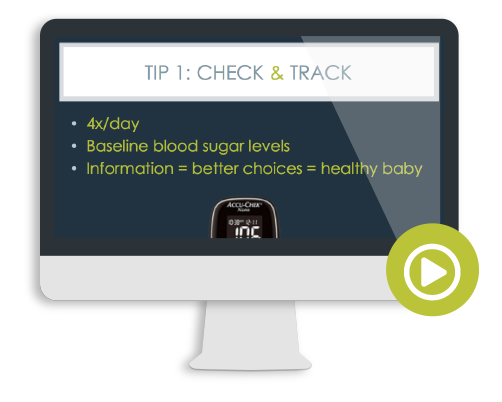 My books on pregnancy and gestational diabetes have meal plans, but I don’t have specific ones for kids (granted, my son just eats what we do). Great article! Since I’ve got a five months old little girl, I’d love to read one about introducing solids too. We’ve been eating a nutrient dense LCHF diet since, including our two and half years old son. Since you listen more to your body, I feel it takes all the pressure off regarding the quantities and times to eat, etc. Therefore, no worries about a toddler not being hungry, I know he is getting what he needs, when needs it. Hi Lily! I just discovered your website. We have a 22 month old who I wouldn’t really say is a picky eater, but definitely has his favorites. Can you suggest snacks that would be good to try? Honestly, oysters or sardines never even occurred to me. Wonderful! Brilliant! Thank you for this! We’ve always done things quite similarly, and I see it “paying off” as my daughter continues in toddlerhood. She is perfectly happy foregoing sweet treats (most of the time), and requests mackeral, capers, cauliflower, etc. as snacks. But yes, toddler and bananas!? What is the deal!? 🙂 Sometimes I worry that I am doing a disservice to her future self by letting her “snack” all day, so your post helps me to feel better. Thank you!